If you missed this month's Spotlight on Arts & Culture, you can listen to the podcast here. Catch Wes Haynes (Connecticut Trust for Historic Preservation), environmental artist Daniel Lanzilotta and Analiese Paik (Sustainne) discuss Creating a Sustainable Future. Discover the ecology of sustainability: buildings as embodied energy, the links between recycling and bringing new life to old buildings, encouraging consumers to make sustainable choices, and how artists play a role in dramatizing and raising consciousness of the danger of plastics in our environment. You can also listen to podcasts of recent shows on Who Cares About Public Art, Creative Placemaking and David Green & Adger Cowans. The Cultural Alliance is joining several Bridgeport groups, including Capital for Change and The NEST Arts Factory, that are organizing to feature the culinary and cultural delights of Connecticut’s most diverse city. The idea is to organize monthly visits to restaurants in different neighborhoods featuring samples of the diverse cuisines of the City: Brazilian, Chinese, Thai, Colombian, Italian, Jamaican, Mexican, Portuguese, Turkish, Vietnamese and more, and to also showcase Bridgeport artists and musicians. The project is called SavorCity and is launching April 28 at Ruuthai's Kitchen at 648 Beechwood Avenue, in Bridgeport’s West End, with two servings of lunch, music by Rick Reyes and paintings by the NEST's Jill Morton. Interested? Space is limited, so reserve a spot at https://savorcityruuthai.eventbrite.com. In May, it's Turkish food at Black Rock's Bereket. The Cultural Alliance is also partnering with other Bridgeport organizations (bikeport co-op, Bridgeport DSSD, Bridgeport Generation Now, Bridgeport Public Library, City of Bridgeport, and Urban Bike Tours of Bridgeport) in organizing the Bridgeport iteration of the international Jane's Walk, May 5. In celebration of Jane Jacobs, the journalist, urbanist and activist who championed new, community-based approaches to planning for over 40 years, Jane's Walks are organized to help citizen's explore their towns and connect with neighbors and contribute to thoughtful conversations about creative, community-driven city building. The session starts at 3pm with a brief meet-up to learn about the legacy of Jane Jacobs; then join one of two bike and two walking tours and learn how to get involved just like Jane. And then end with a drink at Harlan Haus. Sign up here. Denise Susalka, a resident of Redding and Palmas del Mar, earned an MBA in International Finance and worked for 18 years in banking and finance before beginning her art career. Since 2000, she has been channeling her creativity into painting with the same energy that she brought to international finance. Sharing her memories of living in France, Italy, Japan and Puerto Rico and of her travels throughout Asia, Europe, South America and the Caribbean, Denise uses color, texture, and play of light to convey a sense of place in her landscapes, her evocative abstracts and her still-lifes. She's keen to awaken all the senses of the viewer: evoking the floral scent of hibiscus or lavender, the tartness of a kiwi or the sweetness of a mango, the whisper of trees swaying or the roar of the surf, the warmth of the sun or the coolness of the breezes. Teaching, especially children, helps Denise recapture her child-like vision through the eyes of her students. She revels in seeing children incorporate new information with their unique perspective to arrive at something fresh and undeniably original. Denise has exhibited her work in LakeShore Gallery in Bolton Landing, NY; Lady Audrey's Gallery in West Cornwall, CT; Rockwell Gallery in Westport, CT and had a permanent exhibition of her work at Maji-Lina Gallery in Rio Mar, PR until it closed in 2013. 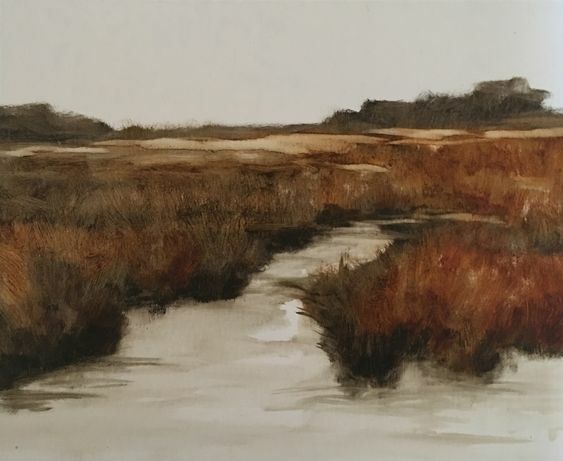 Denise is a founding member of Cannondale Studios and Gallery in Wilton, and exhibits her work throughout Connecticut and Puerto Rico. See her website. Gregg Welz, a lifelong resident of Norwalk, is a conceptual artist who configures cut and folded pieces of drawing paper into repeating patterns, creating gradations of light and cast shadow. From early watercolor lessons at the age of twelve to an art and design education at Pratt Institute in Brooklyn, New York, Gregg has continued to experiment artistically. He notes that his imagination is influenced by geometries found throughout the environment, both natural and man-made. “I am drawn to this abstract process as a means of expressing the visual symmetry around me: architecture, water patterns, or stone walls, for instance,” he says, citing Sol LeWitt and Louise Nevelson among his sources of inspiration. “Using the grid confines or contains the composition to its singular space; I envision the boundaries broken through to infinite scale.” Using paper with texture and weight is important to the artist; he likes the tactile feel of it. The folds of the paper form shadows that make one more layer of pattern and color; even in the monochromatic compositions, the shadows cast a variety of shades. “When I first created the paper cuts series, shadows were a pleasant after effect,” he says. “As my work develops, I look forward to what the shadows may reveal.” Welz compares cutting paper to preparing a palette of mixed paint, and his studio tools are blades instead of brushes. He then lays out the grid and completes each square, over and over. Each piece of paper has been scored, cut, folded, and a fixed with a riser; completion can take several weeks of repetitious practice. Recent shows include at The Lionheart Gallery, (and its online successor, Paraphé), and Rowayton Arts Center (where Gregg won "Best in Show" for the 2016 Community Sponsored Awards Exhibition). See details on the 2-1-2 Exhibition at the Ridgefield Guild of Artists. See Gregg's website here. Bruce Horan and Dorothy Robertshaw are among the artists showing in Transformation, an exhibit curated by Elise Black, at St. Philip Artists' Guild (SPAG) in Norwalk, opening with jazz and poetry, Sat. April 21, 6-9pm. Adger Cowens, Jahmane, Herm Freeman, Aisha Nailah, Lesley Koenig, Ruben Marroquin, and Liz Squillace, are among the artists featured in Welcome BACC! a celebration of the return of the Bridgeport Arts & Cultural Council (BACC), Fri. April 27, 5-10pm at BLENDS Gallery in downtown Bridgeport. Featuring local food, drink, music and of course art, the opening will also be the kick off to BACC's "Celebrate Bridgeport" an inspiring community gathering the fourth Friday of every month, each held at a different location in Bridgeport. Eugenio Diserio, Christa Forrest and Joanie Landau are three of the Loft Artists Association member artists who are "Bringing a Friend to the LAA," that opens next Friday April 27, 6-8pm, at Loft Artists Association. Each LAA artist shows one of their works, matched with that of one of their non-LAA member artist colleagues. Nina Bentley, Miggs Burroughs, Kat Evans, Scott Glaser, Veronica Hofstetter, Jana Ireijo, Amy Kaplan, Jane Lubin, Carole McClintock, Dale Najarian, Kris Toohey, and Cynthia Whalen are all part of the Westport Artists Collective Studio Tour May 5, 10am-5pm. A $25 ticket include a Welcome Brunch and access to 13 artists' studios. Each studio is as unique as the artist and the work, and questions are encouraged. Kristen Ambrosi has several of her large abstract paintings in the Inside Outside Pop Up Gallery in the Colorblends House and Spring Garden, through May 14th, and with an Open House and Reception, Sat. April 21, 10am-6pm. Kristen is also offering an Art and Yoga Workshop for Women: Shift into Spring, Sun. April 29, 1-4pm. Using paint, words, and yoga, the workshop "will set intentions for this shift in the year through various materials and methods, including meaningful discussion, an opportunity to write, a root-to-rise yoga practice, and a serenade of mantra." 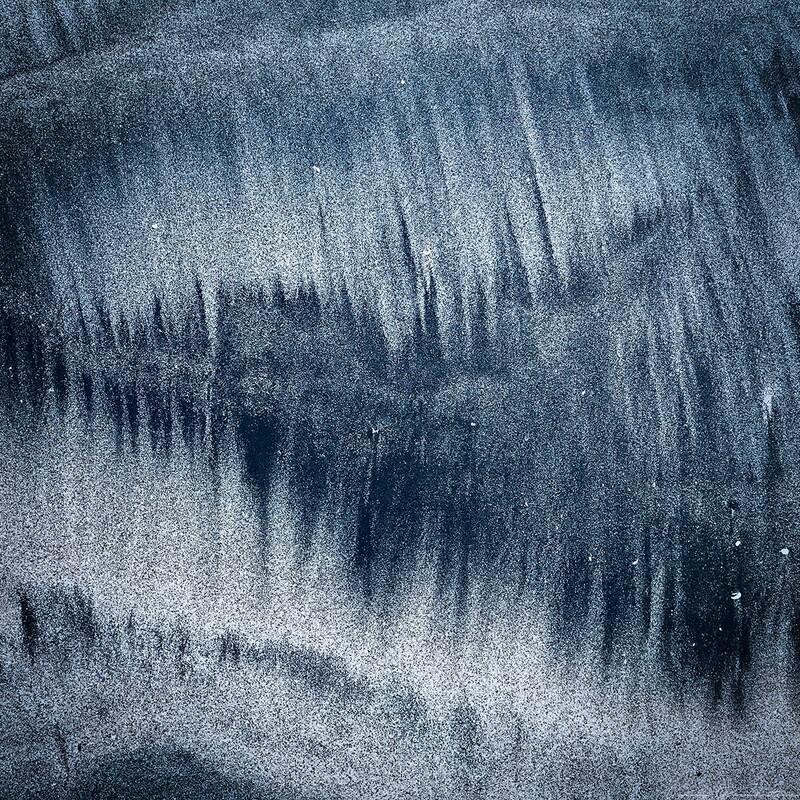 Nancy Breakstone has had her photograph, Reflections in The Sand (24” x 24” at right, click for larger image) juried into the Connecticut Academy of Fine Arts 107th Annual Exhibition at the Mystic Museum of Art, April 20-June 2, with an opening reception May 3, 5:30-7:30pm. Nancy's work also appears in the April issue of The Woven Tale Press online and print magazine (pp.36-39) with an interesting interview here. Eric Chiang had his painting Night Waves (2018, oil on canvas, 36x36) juried into the Carriage Barn's Spectrum 2018 show, opening Fri. April 20, 6-8pm. 21x21 framed, at right, click for larger image) in Perfect Partners: Art in Design, opening with a reception at Silvermine Arts Center, Sun. April 22, 2-4pm, and running through May 19. Sierra is part of Heidi's Dreamscape Series, which reflects an exploration of landscapes inspired by the ancient lands of mythology and cultural lore, whether historical, fictional or fantastical. Eugenie Diserio's painting Chiron (2015, acrylic on canvas, 30x40, detail at right, click for complete image) will be exhibited at The Loft Artist Association's Bring A Friend to the LAA, where members invite a guest to show beside them, opening April 27. Painted in 2015, Chiron, Eugenie tells us, symbolizes the wounded healer in all of us showing how we can learn to heal our deepest wounds and fatal flaws. As an astrologer, she says, "Since Chiron just entered the fiery sign of Aries, this painting was asking to be shown right now." She also has her painting Brave showing at Spectrum. Carol Nipomnich Dixon is showing 17 works at Out of the Box, 73 Greenwich Avenue, Greenwich , May 3-27, 2018 as part of Art to the Avenue. Opening night reception is Thursday, May 3, 5:30 - 8 p.m. Among her oil paintings and collages is her Sunlit Woods (2017, oil on canvas, 30” square, at right). See Scott paint! And more. Scott Glaser is one of 13 artists included in the Westport Artists' Collective Studio Tour on Sat May 5, 10am-5pm. Tickets at $25 are available here. Herm Freeman has six of his new abstract paintings in the Welcome BACC! exhibition at BLENDS Gallery, celebrating the return of the Bridgeport Arts & Cultural Council (BACC), opening with a reception, Fri. April 27, 5-10pm. At right Big City (2018, acrylic on canvas, 40x30). Herm comments that after 20 years of painting landscapes (France, Italy, California, New England...), "I found myself wanting to be ‘unencumbered’ by subject matter...and I turned to painting abstract forms. Funny thing happened: instead of ‘painting what I saw,’ it was more like ‘seeing what I painted!’"
Sholeh Janati has a solo show, an Art Pop-Up Shop at Anthropologie in Westport this Sat. April 21, 11am-5pm. On display will be a series of paintings, Goldfish, inspired by fish and water, such as Bubbles (detail at right, mixed media on canvas, 16x20, click for complete image). In Persian culture, goldfish represent good luck and prosperity, and are often given as gifts to mark the new year, which falls on the first day of Spring. Sholeh painted her first goldfish in honor of this tradition years ago, and has now built upon that for this special event at Anthropologie on Saturday. Joanie Landau will be the featured artist at the Gold Coast Kaleidoscope Dreamlight Event at St. Andrew’s Episcopal Church in Stamford, Sat. April 21, 7-10pm. where she will have several works on display in this "Evening Fantasia of the Performing & Visual Arts." On April 27th, Joanie is bringing MaryEllen Hendricks to the Loft Artists Association's Bring a Friend to the LAA. They will be exhibiting works side by side with a common theme. At right, Joanie's Tree on Main Street (36x24, click for larger image). Joanie also has a piece, From Where I Lie No. 8 in the West Hartford Art League Juried Show, CT+6. opening Sun. April 29, 2-4pm, and running through June 3. In addition to her two photographic works juried into the Spectrum 2018 show: Tomorrow, 125th St. and United Do We Stand , Barbara Loss has several photographs in the Flower Power show at Reads Artspace, opening Sat. April 21, including Floral Arabesque, Welcome to Spring, a 24x36 collection of individual 4x6 wooden panels, each an abstraction designed from flowers she has photographed throughout the years (detail at right). Ruben Marroquin has four of his woven sculptures in the Welcome BACC! exhibition, celebrating the return of the Bridgeport Arts & Cultural Council (BACC), at BLENDS Gallery in downtown Bridgeport, opening with a reception, Fri. April 27, 5-10pm. At right Untitled (untied knots series #1; 2015, mixed textile media, 36x36x12). These pieces have been deconstructed - they've had their knots untied. Congratulations to poet, painter, and consultant Shanna Melton. Shanna has been selected Arts Hero for the Fairfield County region by the Connecticut Office of the Arts. Shanna will receive her award at a ceremony at the Hartford Stage Wed. April 25, 3:15pm as part of CT Arts Day 2018. There are still tickets if you would like to attend. The Arts Hero Awards honor Connecticut residents who are doing extraordinary things in, for, or through the arts. The 2018 Arts Hero Awards theme is Resilience - "that ineffable quality that allows people to recover from setbacks, adapt well to change, and to keep going in the face of adversity." Cynthia Mullins has ten of her amazing floral paintings included in the Inside Outside Pop Up Gallery in the Colorblends House and Spring Garden, through May 14th, with an Open House and Reception, Sat. April 21, 10am-6pm. At right her Blue and White (2012, oil and acrylic on board, 26x30; click for larger image). Cynthia paints oil over acrylic, using a combination of brush and squeegee to create the contemporary look of both graphic (flat) and space within the flower form. 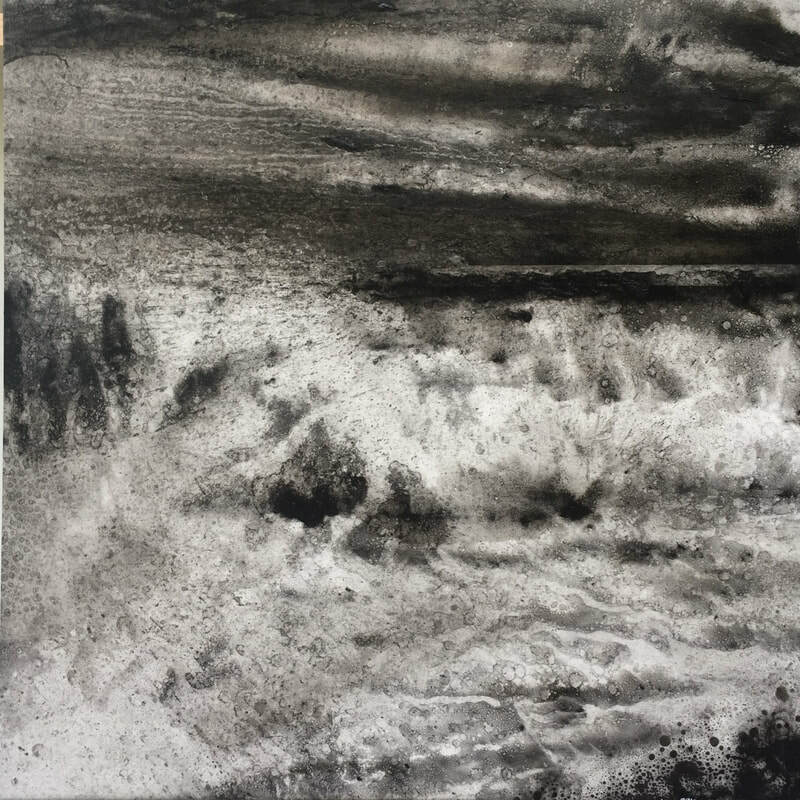 Susan Murray had her piece, Where the Earth Meets The Sky - Witching Hour (mixed media on harbored, 36x18, detail at right, click for larger image) accepted into the Carriage Barn's Spectrum 2018 exhibition. The work shows the expanse of both the universe above and the depths of the earth below, where there is a very fine silver line that connects the two. It is this fine line upon which we all live that we need to remind ourselves, we all have to coexist together. Amy Oestreicher is back home! Fresh from presenting and performing at the Association of Applied & Therapeutic Humor in San Diego, she will be here, live, at the Maker Faire Westport 2018, Saturday April 21, giving a presentation and performance on Art and Resilience from 3-4pm with time for questions afterwards. Painter and interior designer Dorothy Robertshaw has 8 pieces in the Transformation exhibition at St. Philip Artists' Guild (SPAG), opening Sat. April 21 with a reception, including poets and jazz, 6-9pm. The show is curated by Elise Black. Dorothy has several styles of work and mediums. At right, detail of Blossoms (2018, oil on canvas with gold leaf). A palette-knife painting with gold leaf mounted on canvas board as the base and then the "buttery mix of oils." Barbara Ringer had her work Pin Up Girl, (2018, 22” x 28” x 4”, at right, click for larger, complete and more detailed image), a photography-based work, using canvas, safety pins, cotton stuffing, metal and wood, juried into the Carriage Barn's Spectrum 2018 exhibition. The work, barber says is part of a current series that uses a mannequin surrogate to explore self-image, female history, and feelings of anxiety. Roxanne Faber Savage will exhibit Blue Beast, (painting) and Blue Line I, II (prints) in State of Abstraction, an exhibition co-curated by Jacquelyn Gleisner and Daphne A. Deeds, on view May 5- June 16, at the Washington Art Association, 4 Bryan PLaza, Washington Depot, CT, with an opening reception May 5, 4-6 pm at WAA. At right, Blue Beast (2017, acrylic on canvas with tape, 48x48). This is one of four paintings created during a residency at The Atlantic Center For the Arts, New Smyrna Beach FL, Spring 2017, and was a painting investigation done in monocromatic colors (paynes grey + Black), using fingers, sponges, squeegy and water hose; creating works that subconsciously merged ideas about stacking, identity, and elephants. Westport filmmaker Lisa Seidenberg's short film Strangers will be shown at the Film & Video Poetry Symposium April 26-29 in Los Angeles. She recently also attended the Newlyn International Film Festival (April 6-8) in Cornwall, UK where her short film, America premiered. At right, a shot from America. Alissa Siegal is New Canaan Library’s 2018 Artist in Residence and she is conducting a workshop this Saturday, April 21, 12-3pm at the New Canaan Library. Nature Bowls is a "hyper-local" workshop in which participants will create bowls from local newspapers and scrap papers as well as local flora and fauna. The workshop will focus on how we are surrounded by materials that can be transformed, at little to no cost, into handmade decorative and unique objects. Liz Squillace has four pieces in the Welcome BACC! exhibition at BLENDS Gallery, celebrating the return of the Bridgeport Arts & Cultural Council (BACC), opening with a reception, Fri. April 27, 5-10pm. At right, two pieces, Square Angles 1 & 2, (2018, screenprint on board, 60x10; click for larger image). These pieces, Liz says, were born out of a painting experiment that turned into a screenprinted pattern. Her other two pieces are mixed oil/acrylic paintings inspired by a recent trip to New Mexico. Alicia Thompson is performing an extract from her dramatic piece I Am My Hair at Connecticut Arts Day, Weds. April 25, 11am, at The Hartford Stage as part of the “Talent is Universal, Opportunity Is Not” panel, that fits into Arts Day's overall theme of Resiliency. I Am My Hair is a one-woman production of monologues that shares the stories of 6 different female characters. The character “Mother Wise” from the play will be featured on the panel. Alicia comments that Mother Wise will share her story of struggling to comfortably settle in a society in which it’s difficult to be authentic and to be accepted. She pushes through the pain of her past and gains the strength to inspire others on her journey of self-acceptance. New member Gregg Welz is one of the 5 artists selected by juror Judith Tolnick Champa for the 2-1-2 small group exhibition at the Ridgefield Guild of Artists, opening Sat. April 21, 4-6pm. Each artist had 6 months to produce the work. Gregg, who works with cut paper, envisioned a geometric suite of 9 works: 3 each of triangles, circles and squares with a palette of white, black and a bold red. Light and shadows vary in each series. At right Triangle: White (2018, created with scored and folded drawing paper and shadow boxed with acrylic glazing, 32x32, click for larger image). Sat. April 21: Alissa Siegal, New Canaan Library, Nature Bowls Workshop, 12-3pm.